Quote: July 23, 2013: Color and black-and-white images of Earth taken by two NASA interplanetary spacecraft on July 19 show our planet and its moon as bright beacons from millions of miles away in space. NASA's Cassini spacecraft captured the color images of Earth and the moon from its perch in the Saturn system nearly 900 million miles (1.5 billion kilometers) away. MESSENGER, the first probe to orbit Mercury, took a black-and-white image from a distance of 61 million miles (98 million kilometers) as part of a campaign to search for natural satellites of the planet. In the Cassini images Earth and the moon appear as mere dots -- Earth a pale blue and the moon a stark white, visible between Saturn's rings. It was the first time Cassini's highest-resolution camera captured Earth and its moon as two distinct objects. It also marked the first time people on Earth had advance notice their planet's portrait was being taken from interplanetary distances. NASA invited the public to celebrate by finding Saturn in their part of the sky, waving at the ringed planet and sharing pictures over the Internet. More than 20,000 people around the world participated. 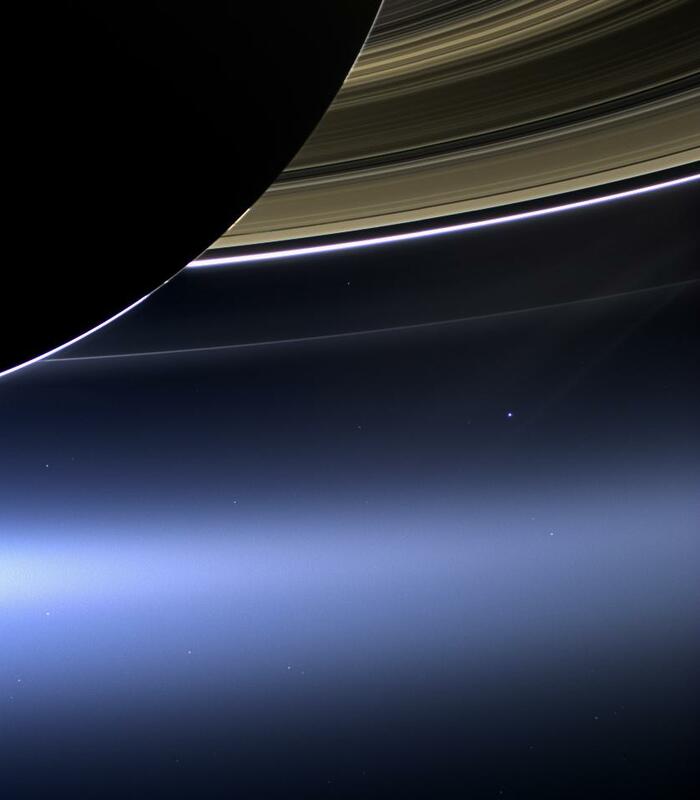 "We can't see individual continents or people in this portrait of Earth, but this pale blue dot is a succinct summary of who we were on July 19," said Linda Spilker, Cassini project scientist, at NASA's Jet Propulsion Laboratory in Pasadena, Calif. "Cassini's picture reminds us how tiny our home planet is in the vastness of space, and also testifies to the ingenuity of the citizens of this tiny planet to send a robotic spacecraft so far away from home to study Saturn and take a look-back photo of Earth." Pictures of Earth from the outer solar system are rare because from that distance, Earth appears very close to our sun. A camera's sensitive detectors can be damaged by looking directly at the sun, just as a human being can damage his or her retina by doing the same. Cassini was able to take this image because the sun had temporarily moved behind Saturn from the spacecraft's point of view and most of the light was blocked. A wide-angle image of Earth will become part of a multi-image picture, or mosaic, of Saturn's rings, which scientists are assembling. This image is not expected to be available for several weeks because of the time-consuming challenges involved in blending images taken in changing geometry and at vastly different light levels, with faint and extraordinarily bright targets side by side. "It thrills me to no end that people all over the world took a break from their normal activities to go outside and celebrate the interplanetary salute between robot and maker that these images represent," said Carolyn Porco, Cassini imaging team lead at the Space Science Institute in Boulder, Colo. "The whole event underscores for me our 'coming of age' as planetary explorers." "That images of our planet have been acquired on a single day from two distant solar system outposts reminds us of this nation's stunning technical accomplishments in planetary exploration," said MESSENGER Principal Investigator Sean Solomon of Columbia University's Lamont-Doherty Earth Observatory in Palisades, N.Y. "And because Mercury and Saturn are such different outcomes of planetary formation and evolution, these two images also highlight what is special about Earth. There's no place like home." The Cassini-Huygens mission is a cooperative project of NASA, the European Space Agency and the Italian Space Agency. JPL designed, developed and assembled the Cassini orbiter and its two onboard cameras. The Johns Hopkins University Applied Physics Laboratory in Laurel, Md., designed and built MESSENGER, a spacecraft developed under NASA's Discovery Program. NASA's Marshall Space Flight Center in Huntsville, Ala., manages the program for the agency's Science Mission Directorate in Washington. JPL and APL manage their respective missions for NASA. The California Institute of Technology in Pasadena manages JPL for NASA.